In my transformative publication, The E’s of Selling Art System – A Guidebook and Flashcards for Face-to-Face Selling, I have a chapter devoted to what I call the “Four Dirty Little Words”. In other words, you need your prospective buyer to know – beyond a shadow of a doubt – that you are interested in what they are interested in. To be crystal clear: they are, we ALL are, mostly interested in ourselves. If you appear to be more interested in YOURself, you lose THEIR interest. Today, the average attention span is about eight seconds. This is especially true during the early phase of first-time engagement. Those first eight seconds need nurturing to move past eight into ten, fifteen and more. You must keep their interest level high enough to spark their attention. If they think you don’t have their interests at heart, they will have a hard time actually considering a purchase. They won’t trust your motivations. This was never more true than today. There is so much competition for our attention. For so many of us, smartphones are a constant pull of energy. Even if the phone is off, it’s still calling out. Therefore, when you have someone in front of your work at a show or in your studio, you are in strong competition for their undivided attention. It’s much more intense than just a few years ago. The only way to sustain interest in your art is to turn the conversation into whatever subjects interest them – the quicker, the better! The goal is to replace all other distractions, keep their attention focused, and help move them towards the consideration stage of the Buyer’s Journey. The easiest way (although it takes some practice!) to make sure you are keeping it more about them and less about you is to get rid of the Four Dirty Little Words: I, Me, My, Mine as much as possible. Find ways to convey your information by increasing the use of You and Yours and use third party references like owners, collectors, or patrons. Collectors of large work are thrilled to have so many choices for their big spaces. Do you have a space that can handle this size? What most art patrons love about this collection/series/piece is _______________. Is there a certain room you have in mind for your next piece of art? While many serious collectors start with a small original, there are some wonderful limited-edition prints you might want to consider, also. I won’t bore you with an endless list of questions or ways to keep it “all about them”. You must find your own words. Just make sure you are creating statements and questions that are client focused icebreakers. You need to find ways to present your work with focused and purposefully structured communications that will keep them interested. For best results, I repeat: remove I, Me, My, and Mine whenever possible and use You and Yours as much as possible. Another key to keeping it real is to avoid small talk. High-value questions are needed in this situation. Resist asking them “Are you enjoying the art fair?” or “Where are you from?” or other such mundane questions. They have had a dozen people ask them the obvious questions already, and you will appear as insincere, or worse – just too salesy and automated. In addition, they may have become tired of answering the run-of-the-mill questions and lose all interest in further engagement. Asking that question is a two-in-one winner! First, it suggests that your work is “seen”. Second, it gives you a clear path forward depending on their answer. If they say “yes”, you can ask if they have collected your work and, if they say “yes”, then you are headed for a great engagement, right? Your collectors are always your best source for additional purchases! If they haven’t purchased, but have seen your work before, they will probably tell you where and have a good story to share. But here’s the real upside to asking the question: if they say “no” you magically have “permission” to give them your quick elevator speech. (You do have a quick elevator speech, right?) A quick intro that entices and amazes and generates interest is your number one tool of engagement. You should have variations, too. If you say the exact same things to the next person who enters your sales area while the other person is still present you will appear to be a robot! And always try to end on a question. After a few quick sentences that sum up what you and your art represent, asking them something relevant will keep the ball rolling. Then keep asking questions. The more they talk, especially about themselves, the more comfortable and relaxed they will become. To be engaging in today’s busy and highly distracted world of cell phones and increasingly shorter attention spans, you need a plan. By showing interest in them and what matters to them, you gain their trust and show that you truly want to help them find art that is a perfect match for their homes and lives. You must be selfless. Be encouraging. Be curious about them and show them you are curious. Asking someone questions and encouraging him or her to talk about themselves is the highest praise you can bestow on another person. Moreover, become a friend. Become the naturally authentic and enthusiastic “salesperson” that overtakes you whenever you’re recommending a favorite restaurant. In a perfect world, they will lose track of time and ignore their phone. That’s a big part of your ultimate goal. Even if they don’t buy today, you broke the spell of distraction and were able to have an engaging exchange. They have gained an interest and you have inspired trust. This leads to being able to get their contact information with very little resistance. Now you can stay in touch. Step one is often the hardest part: Stop talking about yourself, your art, and your process. Find out what they are actually curious about. It’s all about them. Even when they ask you about you, they are still asking about something THEY are interested in knowing more about. It’s never really about you! 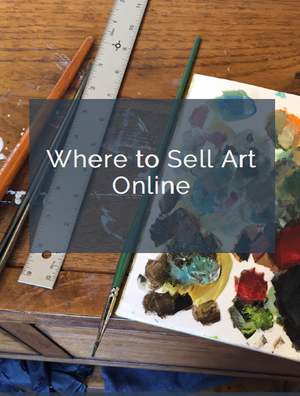 Mckenna Hallett is the author of The E’s of Selling Art System and has been teaching artists how to sell, market, and grow their art sales for nearly 30 years. She also is the co-author with Carolyn Edlund of the Artsy Shark Success Guide to Email Marketing for Artists. She is often called a Marketing Therapist and has a long history of entrepreneurial endeavors since her first creative art sales at the age of seven. Learn more about her on her website. Good one, Mckenna! Definitely a keeper. thank you so much for your very interesting article and I am looking forward learning more from you. I am glad you found my article interesting Helga. You will find many other interesting articles here on Artsy Shark – some others by me, also. And, of course some others on my website. Enjoy! I sell at a farmers’ market, and find it’s very difficult to engage the many people who stop at my table and look over my work, whether on the display board or in my bins. The most difficult part is finding something to say to engage them. There are always people who prefer not to look at you, but the other sort, the ones who deliberately catch your eye, are lovely. But what to say? I’m aware that “How are you?” and “Where are you visiting from?” (for tourists) are not engagements, but as you say, seconds count. I’m not a small-talk person, but more of a story person. Stories, as you say, don’t work either! It’s a real problem. After reading this article a month or so ago about the four bad words, I was very conscious about not using them. But still couldn’t come up with a conversation starter, which always seems to become a stopper! Although I’ve had some really lovely conversations. Sounds like you need to consider purchasing my Guidebook, Barbara. Farmer’s Markets are difficult, but a person is a person and learning how to engage them – woo them – is imperative for your sales. The number one cure is to develop the habit of being curious and asking questions – relevant questions – and that will often break the ice. Surprisingly, where you are standing and how you are set up can also affect those first seconds, too so ask yourself this question: How do people feel – what likely is going through their minds – when the see my work for the first time? Apologies for my slow response – but yes, that was very helpful. This is such great info! I try to eliminate those word in my etsy listings and try to make it about them! Aha! Yes… copy writing and sales pages all benefit from this idea! Thanks for bringing that up! I love customers but don’t necessarily want to be friends, I disagree with that! Oh, Mary! I am not advocating that you befriend them – as if that is somehow possible without both sides being aware and participating. “Become a friend.” in the context of that paragraph means to act and treat this person as you would if they were a friend. Treat them with the spirit of friendship. Be a friendly “asset”. Create a tone and a sense of dedication to their best interests – as you do with a friend – so when you recommend a purchase (or ask for the sale), they know you are coming from an authentically caring place and not just trying to make a buck. Hope that clears things up and sorry if that confused anyone else! This is a great article Mckenna. I am naturally very shy so hearing these wise words has actually helped a lot. I much prefer talking about other people as I don’t find it natural to talk about and ‘sell’ myself! You’re Welcome, Jasmine! Honestly, it’s not instinctive, but you can take solace in knowing that no one is wanting you to fail. A smile can start your journey and that can lead to a deep trusting engagement. Just be yourself – even if that feels a bit awkward. Love this article and great information we will work to change how we go about postings and information on our website. Thank you for sharing your experience with us that are just starting out in the art industry (business) If you have never seen our work here is the link to http://inthelightart.com/ you will fined murals, fine art, foam sculpting and prints for sale. There is also good information on what fine art is and about murals to help you understand your art. In The Light Artistry – Painting Memories Together! Thanks, Jeremy! Indeed – it’s a fine line knowing when they want to know a bit about you vs what you can do for them to keep them interested. Sometimes it can be “self-importance” but often it’s just habit. We know how to talk about ourselves and tell our stories much better than just about any other subject. It can be hard to talk about the art (marketing/selling) but easy to talk about the process or our mindset. Photographers often end up talking about where, when, and how the shot came to be, instead of just letting the image live on its own and finding out what the viewer is enjoying and where they might consider hanging it in their home.